LINCOLN, Neb. (AP) — James Palmer couldn’t make a shot the first 16 minutes against Seton Hall. He couldn’t seem to miss the next 24. 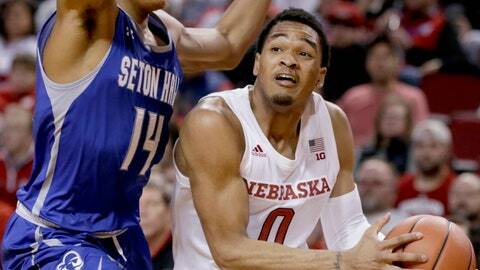 Nebraska’s All-Big Ten guard overcame his cold start to score 29 points, including a huge 3-pointer after Seton Hall pulled close in the second half, and the Cornhuskers pulled away for an 80-57 win Wednesday night. The Huskers (3-0) ended a seven-game losing streak against opponents from the Big East with their dominant performance in the Gavitt Tipoff Games. Palmer started 0 for 8 from the field. His first make came with under 4 minutes left in the first half when he hit a 3 from the top of the key. He released his frustration by pumping his right fist like he was spiking a football. “I was just happy I finally made a shot,” said Palmer, who made 7 of his last 12. Nebraska came out sharp in the second half and built its 33-27 halftime lead to 10 points before Michael Nzei scored a quick six points to cut the lead in half. The Pirates pulled as close as 44-42 after Nebraska was assessed a bench technical for its reaction to Isaiah Roby being called for his fourth foul. The tech seemed to inspire the Huskers. Palmer opened a 9-2 spurt with a 3-pointer, and Thomas Allen finished it with a deep shot to make it 53-44. The lead went over 20 points when Roby threw down a lob from Glynn Watson Jr. for a dunk in the final 2 minutes, and the Huskers ended the game on a 36-15 run. Copeland Jr. had 18 points and 10 rebounds and Watson added 14 points and eight assists for Nebraska. … Seton Hall’s Myles Powell, who tied his career high with 30 points against Wagner on Nov. 6, led the Pirates with 24 points. … Nzei finished with 13 points and nine rebounds for Seton Hall. “I loved their effort and I liked their attitude. I felt their attitude all the way through. Even when we got down 13 late, they were talking about how there was still a lot of time left, keep your heads up.” — Willard.